In our first article about SHOT Show 2017 we are going to cover one of the biggest hypes going into it, the Hudson H9. Companies have to be careful when coming into a product launch with such a large build up, if you over hype the product or it’s capabilities you run into the issue of under delivering and disappointing. One would think marketing companies would be quick to temper some of the hype or claims so that a new product would exceed expectations rather than fall short. Many firearms companies don’t hire or consult with those in the industry and this may be partially to blame. One only knows how much more successful the Springfield Saint would have been if there was less initial hype and the marketing push came as the product was unveiled. The industry collectively sighed when we found out it was “just another AR”. While SA was certainly thrilled to be unveiling their first AR-15, all the rest of the industry saw was another entry level AR. This isn’t a ding on the rifle itself but on the marketing hype leading to the unveiling. I have this intro to both set the scene for this review as well as hopefully help future companies save themselves from what’s happening, or may happen, to Hudson. First the good. I love innovation and I love to see “new” designs. Not that this is a completely new design as it borrows from many designs over the years but it is a new design and I love to see that. The trigger on the H9, both the displays and the live fire gun were very nice. I wouldn’t say a perfect 1911 copy by any means but it was a very nice trigger for a striker fired handgun and the hype was met, or at least justified IMO. 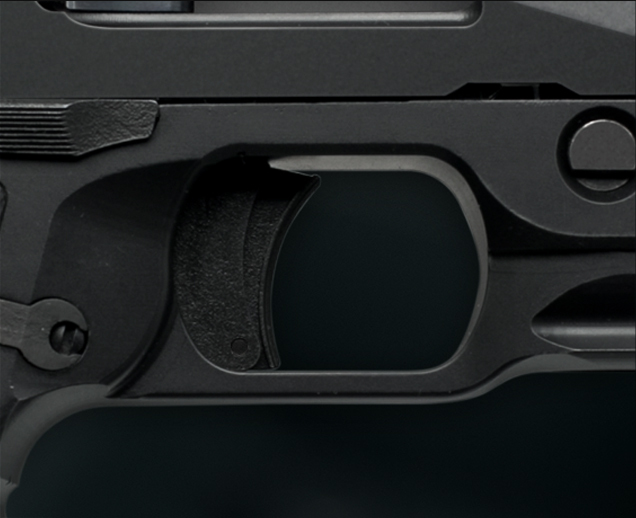 This is where the H9 falls very flat. 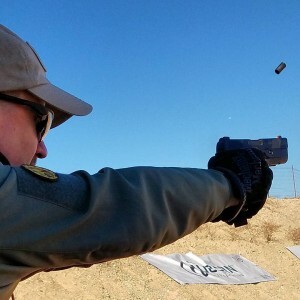 If not for the hype of the improved recoil impulse I probably would have found it unremarkable, or at least within the realm of any other full sized 9mm polymer striker fired handgun like a Glock, XD or M&P. Because of the hype on the trigger and on the recoil, I was primarily focused on that. It also helped that there was nothing to actually shoot at on the Hudson line to tell where your rounds were hitting, so I didn’t have to worry about aiming at anything… but that’s for another paragraph. I said the recoil was unremarkable for a 9mm polymer striker fired handgun BUT the hype was about how greatly the bore axis improved it and I thought it was actually a touch “snappy” for a full sized 9mm handgun. Somewhat more akin to the recoil impulse of a smaller handgun like a G43, XDS or Shield, not quite as pronounced as that but similar. Looking at the Hudson booth there were around 10 display H9’s with the firing pins removed and only one functional H9 on the line to shoot. This begs the question, after so much hype how can you have a full shooting bay to yourself and only have one handgun on the line to fire? Yes the excuse may be that guns needing to be checked for SHOT must have the firing pins removed, be officially checked in and that logistics mean in order to have enough handguns ready their booth for the four floor days of the show they went this route but I can’t help but wonder if that’s truly the case. Later in the day the line to shoot the H9 stretched out of the bay and was dozens and dozens of people deep. If nothing else it was extremely inconsiderate to tie people to such insane wait times on a day when time is a premium with only one functional handgun on the line. I’ll leave the assumptions up to you as to why a company would have at least 9 demos that couldn’t be shot at “Range Day” and only 1 functional handgun. I’ll be honest this isn’t an easy article to write. I have very limited experience with this handgun, and at this moment I don’t believe anyone else in the media has any more experience with it yet either. I’ve seen some glowing reviews and I just don’t see where the glow is coming from. I don’t understand why there hasn’t been some more “tempered” response, given what we’ve actually seen so far vs what we have heard. 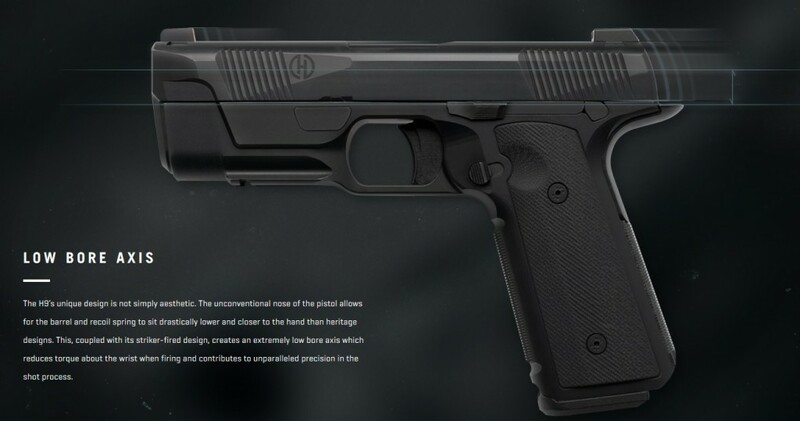 I’d like to thank Hudson for their time and I look forward to spending more time with the H9 in the future, it’s a cool design and does have promise. I’m just not ready to hop on the band wagon and starting singing Hallelujah quite yet. 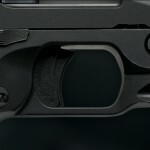 « Previous Post: Back up Iron Sights? How and why we decide what gets them and what doesn’t.